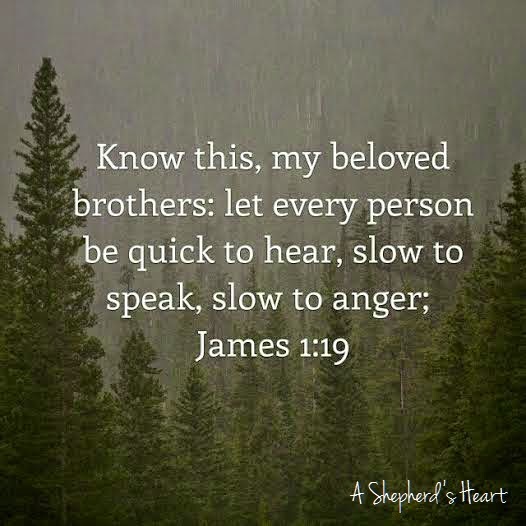 Heavenly Father, help us to have wisdom to know when to speak and when to wait to speak and simply listen. Help us also in times of debate or arguments to be careful to not respond with words of anger as words are really hard to take back. I also think of the old saying, "sticks and stones may break my bones but words may never hurt me." although I understand the sentiment...this statement is really a lie because words spoken in anger, etc stick with us and it takes a long time to heal! You teach us that our words can be a blessing or a curse... They can bring life or death to the hearer so help us speak words of blessing and life or not at all. This isn't to pray or say we will never have to work things out but it is to circle back around to the need for us to be slow to speak and quick to listen.... So we can speak words of wisdom, life and blessing when it's time to speak...until then, let us learn to be good listeners. These things are not easy so we really need Your help!